Last night was the second in the Summer long Hillingdon circuit race series. I am going to ride these as training (though see this interesting piece on ‘Racing is not training‘). I need to work on raising my effort and crits should help this. Or at least they should if I made an effort. 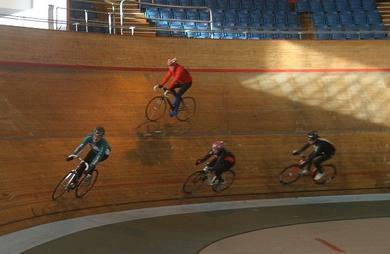 The picture, by Ian Why, is from last week’s track training session. I am third in line and letting the gap open. The 4th category race was pretty even-paced and I should have got to the front and tested myself. As it was I shuffled about nervously following wheels for most of the race. I got to the front once when the grown ups (E123 race) passed us for the second time and the race was temporarily neutralised. Not a bad ride though – I never felt under pressure and finished in the bunch. It was nice to be back on my race road bike. I stripped the bottom bracket out of it at the beginning of the Winter and have had a rebuild on my ‘to do list’ ever since. Last week’s failure of my training bike meant that I had to get down to the work and in the end it only took 30 minutes. I put a new chain on as well. I hate the Shimano chain lottery: will it break or not? So far, so good. >It felt like the season started in earnest this weekend. Two low-key events, but the weather was better and, of course, the hour went back on Saturday night. Saturday morning I picked up club-mate Simon and drove to Bentley for a Farnham RC club ’10’ on the H10/8 course. The weather was good and the roads felt right. There was a slight headwind to the turn and a flyer back. I’ve done a long 23 on this course, so I hoped for a decent ride. In line with recent results I recorded a course worst, but I’ve never ridden it this early before. The fastest man was Xavier Disley with a 22:06. I recorded a 26:31 and Simon barnstormed to a personal best 24:27. It was well worth the 6am alarm just to experience the last couple of miles at close to 30mph. Looking at the numbers my average heart rate still seems infeasibly low – this time last year my average heart rate for a ’10’ was 160-162bpm. This weekend’s rides both came in at 148-149 despite the perceived effort being the same. Race stats: Time: 26:31 (22.63mph). First 5 miles: 14:25, last 5 miles: 12:06. Top speed: 33.9mph. 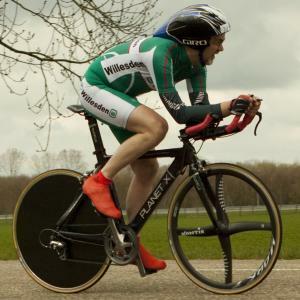 Slowest mile (2): 3:09 (19.05mph), fastest miles (9 and 10): 2:10 (27.69mph). Average HR: 149bpm, maximum HR: 160bpm. 14 of 27 finishers. Winner: Xavier Disley (…a3crg) 22:06. Sunday was another early alarm – 5:15am before you allow for BST. 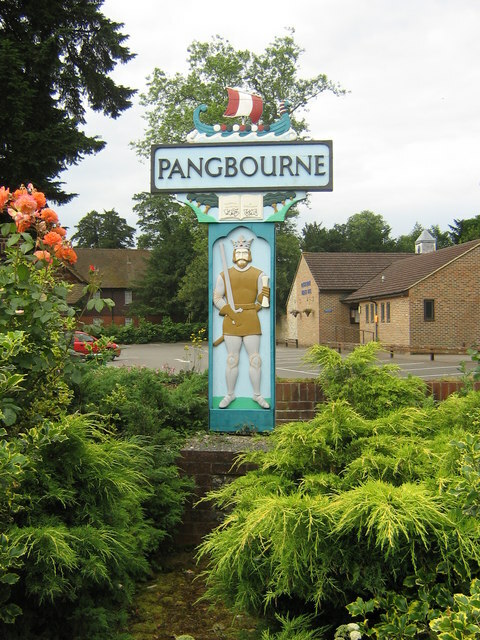 This time it was Great Missenden for the VTTA (London and Home Counties) 10m TT on the HCC180 course. I’ve ridden this event twice before, so it was nice to ride an event PB even if the time was slower than yesterdays. There was a light tailwind to the turn which turned the normally fast finish into a bit of a struggle (not helped by being caught by a speedy Andy H of the Westerley towards the end). Willesden CC team mates Peter and Chris won the two-man team prize for fastest team of VTTA members on standard. There was no champagne, but the bara brith and bread pudding (neither on the sinister list yet) were excellent. Race stats: Time: 27:14 (22.03mph). First 5 miles: 13:20, last 5 miles: 13:54. Top speed: 29.2mph. Slowest mile (7): 3:10 (18.95mph), fastest mile (4): 2:20 (25.71mph). Average HR: 148bpm, maximum HR: 158bpm. 14 of 22 finishers. Winner: Malcolm Woolsey (Westerley CC) 23:10. Easter weekend promises some fun events but the rest of April is looking a bit bare for time trials. 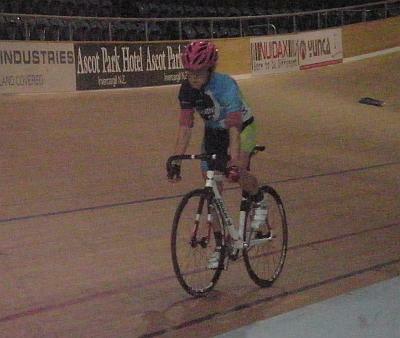 Hopefully I’ll get some track work in to keep the cycling interesting. >A new departure for us last night… Pat and I went to take part in the Hewer Street Annual Pancake Race. This is a fiercely fought affair with a magnificent trophy at stake. I’d heard about the rough and tumble and dark practices that characterise the event, but I thought a background of circuit racing and over-competitive Boggle might serve me well. 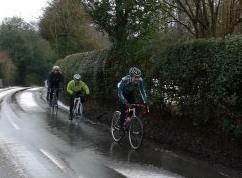 The lashing rain and tricky underfoot conditions meant that Pat opted out. A wise decision. I had underestimated how hard people would fight to win. I had overestimated my ability to toss at speed. I finished nowhere – a bitter but wiser man. The controversy, however, was all at the sharp end. At the last possible moment before that start, last year’s winner, Big Simon, unveiled his secret weapon. It was massive, it was deep, it was a bloody wok. Science has taught us that a pancake cannot be spilled from a wok never mind how enthusiastic and inept the tossing. The wok’s aerodynamic shape creates ground effect which help keeps the tosseur close to the ground and to make up time at the turn. But is it legal? Despite all of this technological help Big Simon was running second to Little Simon (no relation) as the line drew closer. Suddenly there was uproar – Little Simon had spilled his battered confection and was scrambling in the road to re-house his crepe. There was (unproven) talk of a laser pointer being used to blind him mid-toss. Big Simon let out a roar of triumph, accelerated and dipped to take the tape first. The crowd went wild. There were protests – there always are – but no rule had been broken. This is a hard man and woman’s sport. Big Simon is the champion and takes the cup. His write up of the event is here and here. It doesn’t quite have the elegance of Big Simon’s machine, but I will improve it. I will get better. 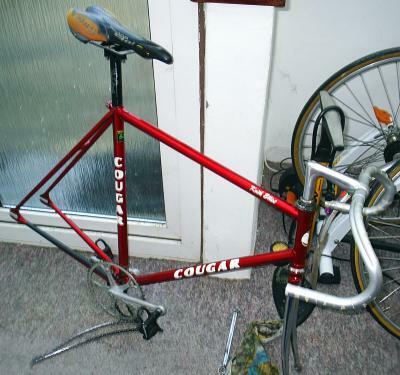 My other project is a track bike (below), but that doesn’t seem so important now. 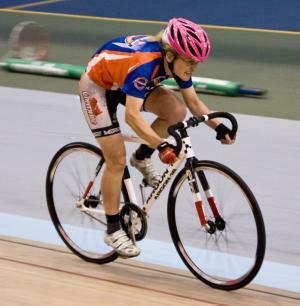 >Saturday was my first trip to the Calshot velodrome for the Prime Coaching training session (there are more through the Winter). The track is only 142 metres around, so I was worried I’d find it more difficult than the 250 metre Invercargill track that I rode in August. In fact the tighter corners make it much easier to ride high on the banking (more g forces) and it feels a lot safer. The only problem is holding the bike down on the black line as everything is conspiring to push you uphill! I really enjoyed the session. 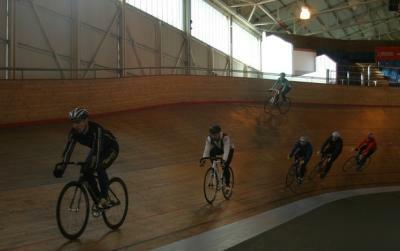 If you’ve never ridden an indoor track before I recommend Calshot and the Prime Coaching team. Sunday was less fun. The Autumn hill climb season has a great tradition, so I thought I’d have a go at the West London Combine event up Windsor Hill. It’s only half a mile after all. How painful could it be? To my shame I never got as far as the pain – I rode through the first couple of corners and jacked it in. My heart rate wasn’t high, I just felt totally negative about the whole thing. Not good and symptomatic of a continuing issue. 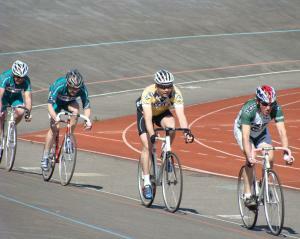 The event was won by Rory Atkins of the Twickenham CC with a 1:58. 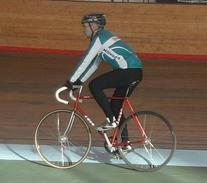 Second was Willesden CC‘s own Stuart Birnie. It was nice to ride out to the event with the club. A bit embarrassing riding back though. 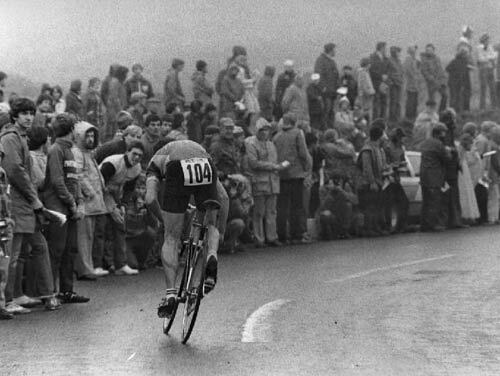 The photograph of a British hill climb is by the late, great Bernard Thompson.